Medical sales is a relationship business, but there are many medical sales professionals who spend too much time being a “friend” and not enough time helping their “friends” achieve better clinical outcomes by getting their products into the customer’s hands. In this episode of The Medical Sales Guru Podcast, Mace Horoff discusses the pitfalls of becoming a “professional visitor” and creating a mindset to avoid the trap. Most medical sales professionals are great at building relationships with customers who can say “yes” to their products or sign a purchase order, but if these are the only people you are paying attention to, you may be leaving money on the table. 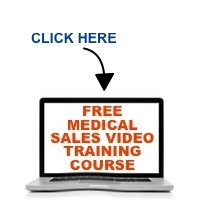 In this edition of the Medical Sales Guru Podcast, Mace Horoff describes a situation where the sale was influenced by a hospital employee who is not normally involved in the buying process. Learn to adapt an easy habit that could one day pay huge dividends with your customers. The customer who says he is interested. The customer who says he will use your product or service. The customer who tells you that he or she will keep you in mind. But you never hear from them and any attempts to follow-up are fruitless. How do you deal with the frustration of customers who won’t commit? In this episode of the Medical Sales Guru Podcast, Mace Horoff discusses some ways to find out if the customer is serious, or just wasting your time and emotional energy. If you’re in medical sales, what is your brand? The word “branding” has become cliche, in fact, some medical sales professionals like to drop the term on their customers from time to time. What is your brand? It is not the logo on your business card, or the tag line in your brochure, or how much experience you had working in medicine in your previous career. No, it’s something much more important than that. Listen as Mace Horoff talks about your brand as a medical sales professional so you can communicate your brand if its a good one, or change it if it’s not. Rejection – How do you handle it with your healthcare customers? Everyone knows that if you’re in sales, handling rejection is a part of the job. Some medical sales professionals have no problem dealing with rejection while others struggle and allow it to hold them back. In this Medical Sales Guru Podcast, Mace Horoff looks at some of the ways to look at rejection and deal with it so it never interferes with your success. Sure, you need to be knowledgeable about your products and your industry, and you think your customers will be impressed when you show them how much you know! Not so fast…While you may wow some of the medical professionals you call on with your photographic recall of clinical data that you just gleaned from your company’s recent training or updates, others will find you annoying and may decide not to do business with you. In this edition of the Medical Sales Guru Podcast, Medical Sales speaker Mace Horoff relates an incident where he asked a surgeon a technical question and it created an adversarial situation. If you haven’t been selling in medicine for a long period of time, this is some advice you don’t want to miss!